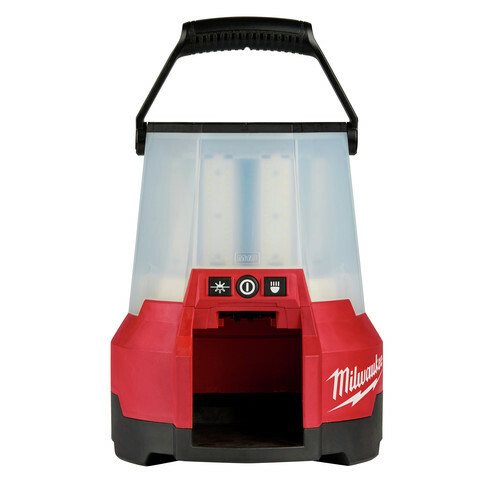 *Add three Milwaukee 2145-20 M18 LED Site Lights to your cart and the free item will automatically be added. Limit 2 free items per customer. Offer valid until 11:59pm ET on April 30, 2019 or while supplies last. No adjustments to previous purchases. Subject to change without notice. Milwaukee's RADIUS Site Lights capable of filling an entire workspace with light, RADIUS Site Lights deliver 360 degrees of TrueView high definition output. Whether lighting is required for task, area, or overhead these lights provide maximum coverage in a portable, high impact polycarbonate lens. The M18 Radius LED Compact Site Light is the World's first high output cordless site light on the market, and has the ability to provide light in task, area, and overhead applications. With 4,400 lumens of TRUEVIEW High Definition output, the M18 Radius LED Compact Site Light provides enough light to illuminate large work areas, and can be turned down to as low as 1,000 lumens for working in confined areas. A high impact polycarbonate lens, and IP54 ingress protection allows it to live in the toughest conditions. The combination of these technologies offers professionals the highest quality LED lighting solution, on or off the jobsite. Love the light very much . I like the feature of in/out electric it actually had enought through it to power my paint sprayer without the light flickering when running . The only downside for that kind of money is it does not charge a battery while being plugged in which would be awesome . I'm really impressed with the quality of light that this unit puts out. I used it to do some cut in painting in a bedroom and it worked really well for seeing the edges of the trim work and along the ceiling. Also used it in a poorly lit garage, hung it from the garage ceiling and I was able to see all measured marks on trim work with plenty of light. Very pleased with the durability and quality of this unit. It would have been an absolute out of the park success for me if they made the base of the light magnetic or had at least a magnet base option. I own 4 different Milwaukee M18/M12 lights and this one by far is the best over all work light I have purchased. It's great that you can use an extension cord to power it or make it portable with a battery. The light output is amazing and different modes help save battery life if your working in one spot. Is there a tripod mount? How far does it shine? BEST ANSWER: Yes, the 9.0 AH battery will fit on the 2145-20 Compact light. Yes the 9.0ah batteries fit. I use them in mine. Does charger an battery come with it? BEST ANSWER: Model 2145-20 is a bare tool item. Which means the battery and charger are sold separately? no, mine was a bare tool. Is Milwaukee still offering a free charger and battery with this light? BEST ANSWER: Milwaukee is not currently offering any promotions on this light.